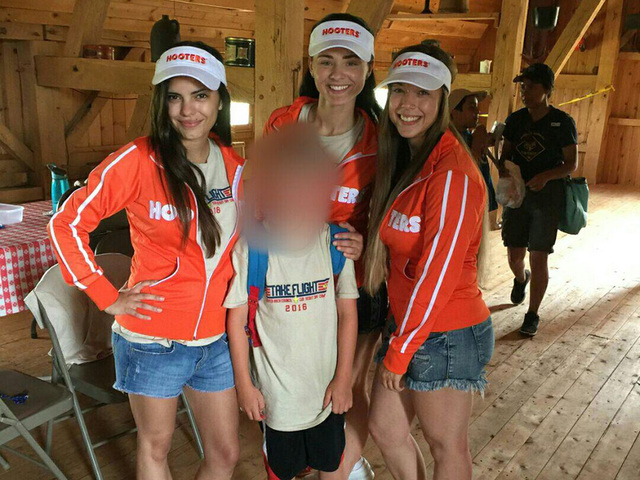 Scouts: Volunteers wore "wrong attire"
Parents were outraged after finding out that Hooters girls had not only posed for photos with a Colorado Cub Scout camp ground, but had sponsored the event in the first place. A Denver mom was in disbelief when she picked up her 7-year-old son from the Frontier District Day Camp and saw the Hooters girls. "...And I step back for a second and I take a look and I'm like, 'are they wearing Hooters visors? Wait a minute," said Michelle Kettleborough. Hooters Colorado has since removed photos of the event from their Facebook page. The Boy Scouts of America Denver Area Council said Hooters approached them about working with the scouts. Pictures on the Denver Area Council page show the boys having with crafts and make no mention of the girls. A spokesperson for Boy Scouts of America referenced the girls' outfits in a statement but failed to say anything about the decision to partner with Hooters. Although parents complained about the unlikely sponsorship, the outfits seemed to be the least of their concerns. In pictures now removed from the Facebook page, the Hooters employees wore tight fitting camp t-shirts and short shorts. "It’s just the philosophies of the two organizations are polar opposites and I just don’t think they should be together," said Marsha Corn, another concerned parent. Both families have a history with the Boy Scouts. Corn's husband was an Eagle Scout and has volunteered with the organization. Kettleborough's brother was in the Scouts as well. "We love the Scouts, we think they made a very poor choice and what I would like and what I think would go a long way again is some accountability," said Corn. Corn said the local chapter dismissed her concerns when she wrote an email to ask questions about the sponsorship. A district executive wrote her back with this response: "The restaurant assisted with the costs of putting on the camp, and through their community volunteering several of their waitresses donated their time to help staff the camp. Glad to hear your son had such a good time." "Quite honestly we're questioning whether we're going to keep him in the organization at all next year," said Kettleborough. A manager at Hooters said they provided three employees each day, during the 3-day camp. The Denver Area Council confirmed Hooters also gave a financial contribution. The camp wasn't free, the cost was $65 per person, according to the organization's website.